Martin Padgett October 27, 2017 Comment Now! Back in the 1980s, Porsche knew it could build an SUV. And it knew a Porsche SUV would sell well. It finally got around to building that first Cayenne in 2002. Instincts: correct. Since then, it’s sold more than 770,000 of them. It’s so successful, Porsche now sells a smaller Macan SUV. An epoch-making moment looms in the not so distant future. 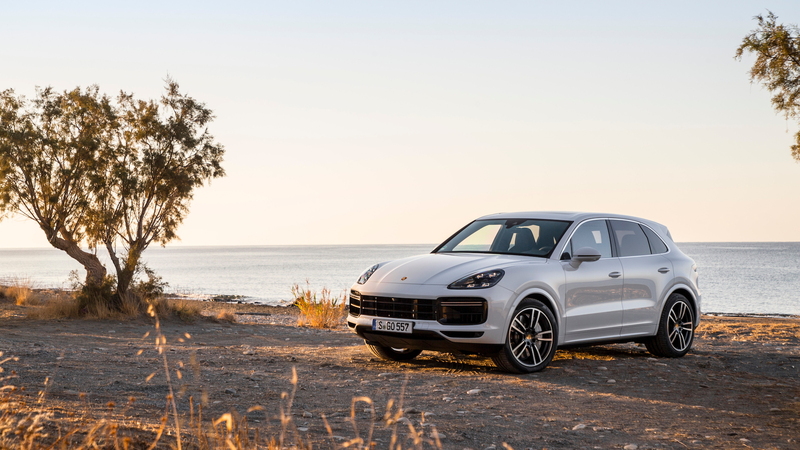 The new 2019 Porsche Cayenne makes it nearly certain that, at some point in the next few years, the big sport-utility vehicle will become the best-selling Porsche of all time. The TL;DR here? 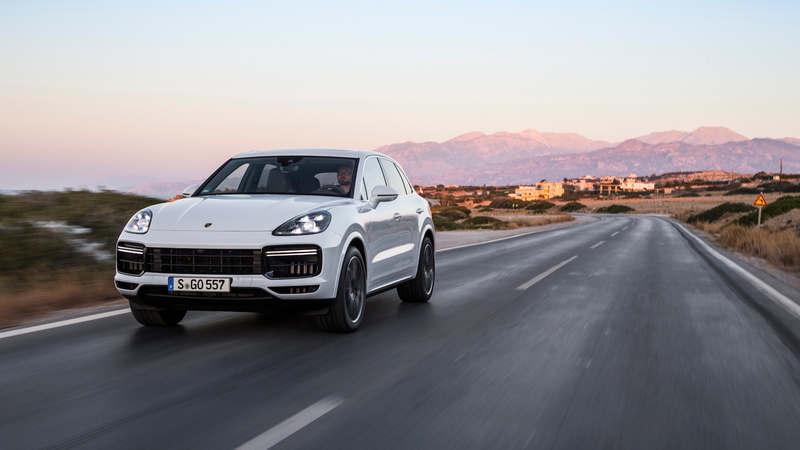 The new Cayenne is fluent on both the smooth and civil roads and the dirty grunty stuff Porsche drummed up for us as we looped around the Greek island of Crete, in the early throes of shuttering down another thronging season of tourists. We made a dramatic departure to drive the new Cayenne, but the Cayenne itself makes few big leaps. Its shape is tamper-proof, completely in line with the 2002 original. It’s a bit bigger and more curvy than before, but you’ll have to look closely at the ribbed front air intakes and the slim LED taillights to tell it apart from previous versions. We see faint hints of Panamera in its fascias and in the more cohesive shapes that collect at the rear. The 2019 Cayenne offers a trio of engines. All have turbos, but some have more turbos than others. In base models a 3.0-liter turbo V-6 with 340 horsepower and 332 pound-feet of torque can reach 60 mph in under six seconds (5.9 seconds, or 5.6 seconds with a Sport Chrono bundle that pokes engine and transmission software with a sharp stick). Top speed is set at 152 mph. Behind a wall of acoustically treated glass, the monoturbo’s a smooth talker, without much of the lumpy V-6 noises we’ve heard in other 60-degree units. The Cayenne S has a 2.9-liter twin turbo V-6 with 440 hp and 406 lb-ft. Essentially a slightly destroked version of the base engine with another turbo, it’s down slightly on torque but up 20 hp over the prior twin-turbo V-6 in the last Cayenne. The new twin-turbo version hits 60 mph in under five seconds, and can reach a top speed of 164 mph. 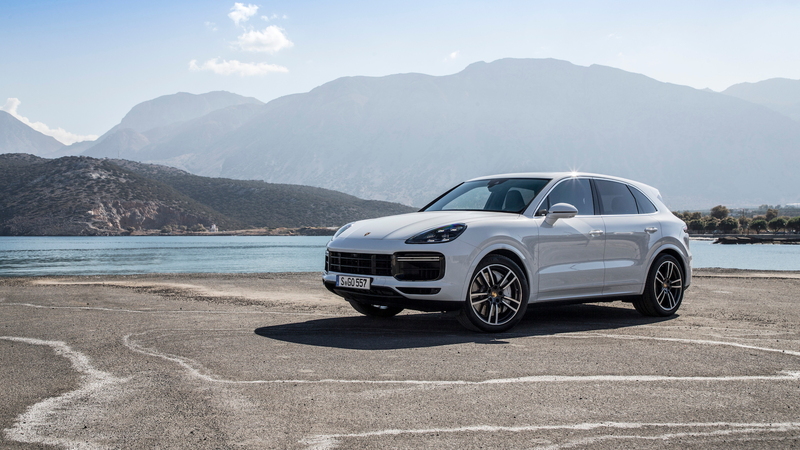 The Cayenne S surges ahead with authority–but if it’s blistering acceleration you need, only a handful of machines on the road can keep up with the Cayenne Turbo and its shuffling V-8 roar. The ground-stomping Cayenne Turbo, with its 550-hp twin-turbo V-8 has 567 pound-feet of torque. It guns to 60 mph in under four seconds (3.7 seconds with Sport Chrono) and stretches to a top speed of 177 mph. Its turbochargers nestle between the cylinder banks for better airflow and quicker light-off. It’s up 30 hp and 14 lb-ft over the prior version–and compared with the fine V-6s, its mellifluous roar seems to make its upgrade price worth it alone. No, the Cayenne’s not the quickest SUV on earth, nor is it the fastest one. The related Bentley Bentayga claims a higher top speed, while the Jeep Grand Cherokee Trackhawk’s brochure suggests 0-60 mph times of 3.5 seconds. But the Porsche’s close, and there’s a lot left in the tank. The plug-in hybrid found in the last Cayenne hasn’t yet been confirmed for Gen 3, but we’re confident it’s on the way. In the meantime, Porsche adds stop/start and active air shutters to smooth air and save drams of fuel. On Turbos, an active rear spoiler does the same, and also flips up to help slow the Cayenne more quickly from high speeds. The touches are helpful, and so is a lightening program that mixes materials in the Cayenne’s body to make it weigh less. Base models check in at 4,377 pounds; the Cayenne S weighs 4,454 lb and the Cayenne Turbo, 4,795 lb. All coupled up with an 8-speed paddle-shifted automatic and all-wheel drive that conspire to route and reroute power constantly between the front and rear wheels–and across the rear axle on vehicles with Porsche’s torque-vectoring differential. Porsche’s AWD system biases power to the rear, in a progressively higher ratio in Sport and Sport+ drive modes. That’s great on pavement; off-road, the Cayenne can ford through 19.7 inches of water, and can hold oil pressure on a 45-degree incline. On any terrain, it can tow up to 7,700 pounds. The Cayenne’s basic under-drag includes a basic strut-and-link steel suspension, 19-inch wheels and tires (staggered at 255 front, 275 rear), and electric power steering. It dresses up with three-stage air springs and dampers, 20- or 21-inch wheels with Michelin Latitude Sport 3 tires, rear-wheel steering, and active roll bars that firm up to neutralize some body lean. The three-chamber springs and the twin-tube shocks are driver-adjustable, same as the steering and transmission. On Cayennes with the Sport Chrono package, a round dial toggles the Cayenne’s personality through those drive modes, from comfortable and composed cruiser to heavy-breathing lead foot. We drove on the rumbly roads here on the island of Crete, and went for miles off-road as the Cayenne picked its way through sharp-edged rocks. All three drivetrains were available, but all vehicles had the pricey ride and handling bits: rear-wheel steering, air suspension, torque-vectoring rear end, and 21-inch wheels with low-profile summer tires. The air springs come in handy; they can lift the ride height from 7.5 inches to 9.6 inches, and can cycle in concert with traction models to traverse rocks, sand, mud, and gravel. On the road, the base Cayenne sets a slightly mellower mood, but flip it into sport modes and paddle through the gears and it responds briskly, with good steering feel and tight corner lines. Porsche’s rear-steer system can turn the rear tires up to 3 degrees in the opposite direction of the front tires at low speeds. That makes the Cayenne feel small–though it hardly squeezes its wider but lighter body through some cramped Greek villages. 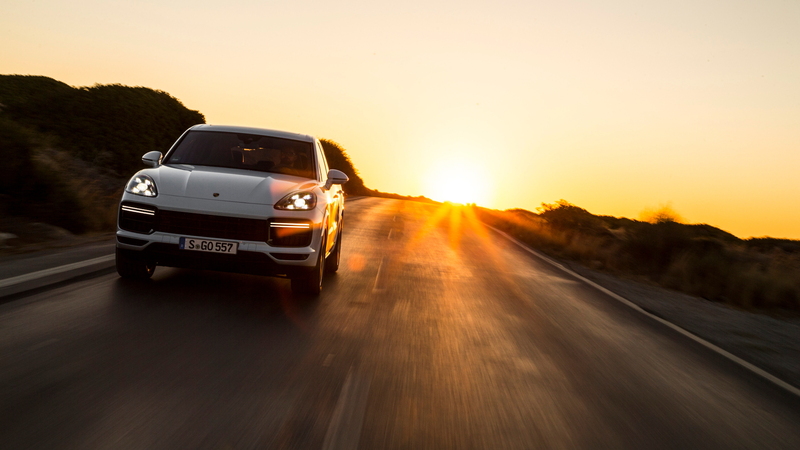 Porsche’s adapted to the new world of electric power steering. The Cayenne’s setup has a quicker ratio than in the related Audi Q7, and it builds up with a distinct heft off-center, as if it clipped on a half-pound-weight. It’s steady and scrutable, quick enough to play with the Cayenne’s rear end through multiple 20-mph hairpins even when the road’s guarded by a series of wandering goats. The Cayenne’s all-wheel-drive system hardly needed any attention through a rubbly path strewn through dusty granite hills eroded into Crete’s rugged terrain. We barely slipped the wheels, even without putting it into advanced traction modes it offers for gravel and mud. We worried more that we’d tread upon some undiscovered and priceless Minoan ruins. Porsche favors very firm steering and suspension–because of course they do. That gives the big-wheel Cayenne a lot of lateral stiffness, even in the softest and most compliant modes. Roll resistance is almost entirely obliterated with the active stabilization system. So while it rolls over clunky cretinous roads with good compliance, the Cayenne’s stiff damping sets up a fair amount of head toss. 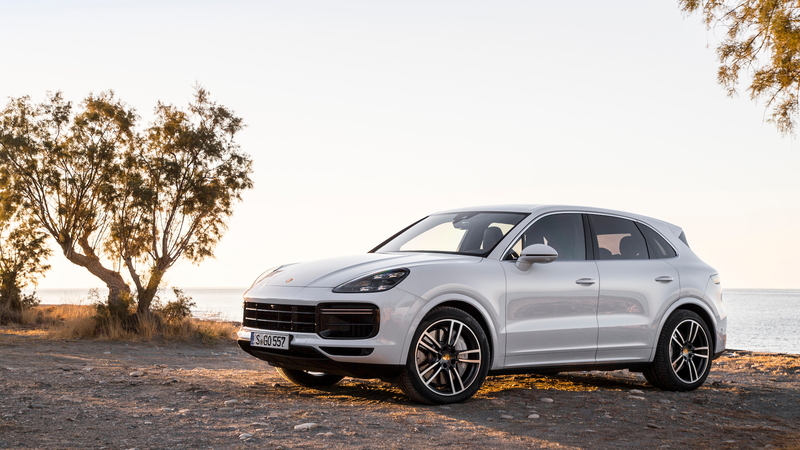 Spawned from the same architecture as the Audi Q7, Bentley Bentayga, and upcoming Lamborghini Urus, the Porsche Cayenne has two rows of seats. Yes, that makes it a five-seater just like the smaller Macan, but the Cayenne flaunts far more generous space inside. It’s bigger than the last-generation Cayenne by about an inch in width, 2.5 inches in overall length, and sits a third of an inch lower. By the numbers, it’s 193.6 inches long, 78 inches wide, and rides on a 113.9-inch wheelbase. About three inches longer in wheelbase than the Macan SUV, the Cayenne has a few inches of extra space in all directions for six-foot-tall front passengers, and fine space for three adults in back. Porsche fits at least 8-way power front seats on the Cayenne; 18-way seats with thigh cushions and heating and cooling are on the exhaustive options list. Passengers have three grab handles, which should send the proper message to anyone contemplating a ride-along as you charge up the highest peaks on Crete or the dustiest ones. Elsewhere the Cayenne’s more soothing console has cupholders, a deep center console, and a smartphone bin that couples with an antenna booster to improve reception. Two or three adults can slip easily into the Cayenne’s back seat. It’s not that much narrower than a modern-day minivan, after all. The bolstering is less pronounced, but Porsche will heat the rear bench, and it fits an 11-position recline mechanism, which would resolve headroom issues if there were any. The Cayenne’s big, and lacks for nothing in the areas of head and knee room. Cargo space is up by 3.5 cubic feet. It’s 27.2 cubic feet behind the back row. Split-fold the rear seatbacks along their 40/20/40 seams and the Cayenne can stow more than 60.3 cubic feet of goods (slightly less on Turbo models). Porsche offers all its latest active-safety technology with the Cayenne, including surround-view cameras and camera views available in off-road drive modes. All Cayennes get LED headlights, power front seats, leather, navigation, 10-speaker audio, satellite radio, and at least 19-inch wheels. Cayenne S models add 20-inch wheels and tires, the adaptive suspension, and a glass roof. Cayenne Turbos get 21-inch wheels, heated front and rear seats, and an active rear spoiler. You’ll spend more time reading the Porsche options and custom-trim list than you might reading owner’s manual. Options go on and on, from LED-matrix headlights, to thermal and noise acoustic glass, soft-close doors, ambient lighting, adaptive sport seats, night vision, lush leather and wood, and a $7,000 Burmester sound system that’s one of the best we’ve heard. The latest infotainment system has a beautiful 12.3-inch high-resolution screen and a much improved user interface. Like the unit in the latest 2018 Porsche Panamera, it pairs with touch-sensitive controls on the console that have replaced all but a handful of switches, toggles, and buttons. The touchscreen environment and particularly, the voice commands work better here than in so many other infotainment systems, we’d cautiously describe it as one of our favorite interfaces. Prices start at $66,750 and zip easily past the Turbo’s base price of $125,650. Deliveries start in mid-2018, while Turbos arrive late in the year. The bottom line? The Porsche Cayenne made stark sense 15 years ago. Now even the haters have to agree: it’s a thrilling, capable vehicle that bridges the gap between Porsche and SUV perfectly. Internet Brands Automotive accepted travel, lodging, and food expenses to bring you this review.